At JustDating, thousands of members are looking to match with sensual people to chat, flirt, and date. Enjoy the casual aura of JustDating and seek your pleasure tonight! 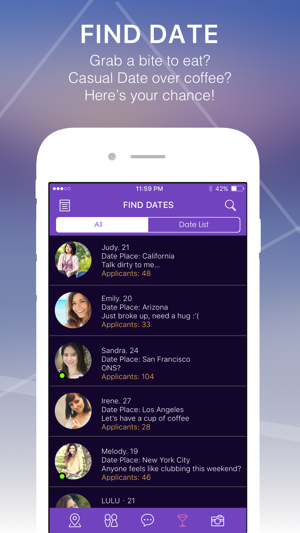 The warm and exciting atmosphere that our app creates was designed to spark intimate conversations with those nearby who are also seeking love and passion. Have fun with our advanced search options and filters to find the matches that are right for you! We have members searching for all kinds of relationships, from those looking for profound long-term relationships, to those that just want to hookup and have fun for a night. Filter through your desires and indulge in connecting with people like you! Why do people near you use JustDating? 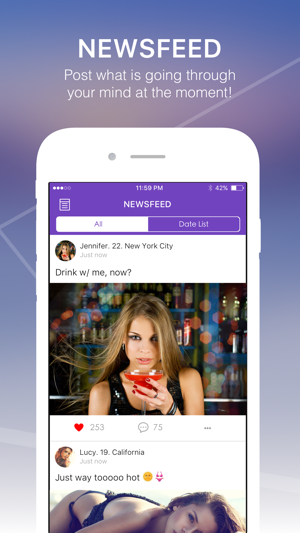 × Find attractive members nearby or across the world on a single page! × Search for dates by tapping the heart if you like the person, and by tapping the “X” if you aren’t interested! × Send a personalized greeting to the ones that you especially like! × Directly message those you find interesting and invite them out for a night of romance and fun! × If you’re bored and looking for a night out, find dates or activities that other members have posted and sign up to join them. You can also post your own activity or date and wait for the right partner accept your invitation! No need to wait any longer! Find your pleasure now and date your matches. 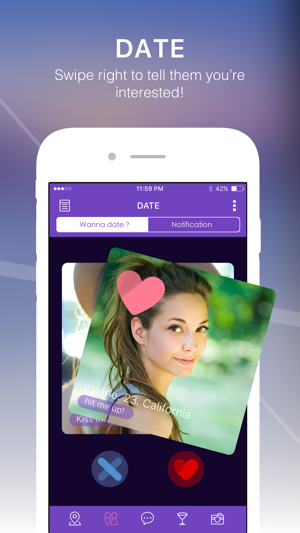 JustDating wants you to have a good time! VIP subscription- starts from USD 15.83/month to USD 39.99/month depending on the period you purchase. We provide you with monthly, quarterly, semiannually and yearly auto-renewable subscriptions. ※ You need to be over 18 years old to register for JustDating. ※ You are not able to search for people with the same gender on JustDating. ※ Your privacy and safety are our highest priorities. ※ 24 hours a day, 7 days a week of customer services on JustDating app. Important: Uninstalling an app will not automatically stop your subscription. You must cancel your subscription to end your subscription. If you uninstall the app without canceling your subscription, you will still be charged. This updates includes stability improvements and minor bug fixes. it keep on crashing on the heart page ？ it was fine yesterday but i can’t click into the heart page or it just crash when I try to. It was fine yesterday ?? ANY QUESTIONS PLEASE DO WRITE TO US WITHIN THE APP AND WE'LL BE HAPPY TO HELP! This is a members only app. You can’t send or read message unless you pay for membership. You received several messages but the profiles looked fake so I don’t want to pay to read fake messages. Thank you for the feedback and pointers, we will continue to improve. I’m sure apple isn’t aware of the poor lack of security this site offers. Most daters are false props so to speak. They steal people’s profiles from sites and use the images pretending to be a catch. They constantly are giving you a pitifully story to get you to send ITunes cards so they can cash. Don’t do it, it’s a scam. Apple, shut these people down! On top of our stringent screening process, preventing scams/frauds on our app. Any questions, please do ask us in the app so we can better assist.